At Nicolet Service Center, we are very proud of our expertise, our facility, and the high-quality work we do and invite you to come behind-the-scenes for a sneak peek of what goes into repairing and refinishing your vehicle. 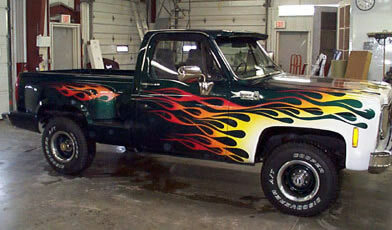 "This gorgeous 1977 Chevy pickup looked very different before the pros at Nicolet Service Center performed their "magic"! Before any refinishing can begin, care must be taken to ensure that the final outcome will be exactly what our customers expect. To achieve the showroom-quality finish that we strive for, it is vital that we prep the surfaces that will be refinished to new or better-than-new condition. Depending on the circumstances, that may mean removal of the original finish, dent removal, reversal of weather damage, frame straightening and Unibody repair, and even complete replacement of body panels. After repairs and prep work are completed, we move parts ready for refinishing to our semi-downdraft bake spray booth where we will apply the finest finishes. First, any area not to be painted is carefully taped off. 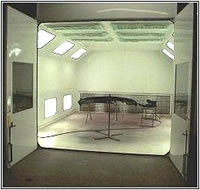 Your finish is mixed in-house and then applied by spray technicians with more than 35 years of experience. 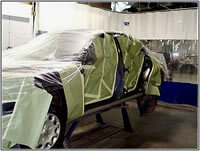 Once the finish is applied, the vehicle will remain in a controlled environment while the finish sets and cures. Finishing touches are performed after the final top coat has been applied including touch-ups, re-installation of trim, and a deep, multi-stage buffing. Only when we are satisfied with the final results will we know that our customers will be, too! At Nicolet Service Center, we understand that your vehicle can be a source of pride and enjoy working with our customers on creating personalized, custom looks. From simple graphics packages to complete custom finishes, we will work with you to create a one-of-a-kind design that you will be proud to be seen driving. Don't think that your car, truck, motorcycle, boat, motorhome, etc. has to be damaged before we will work on it! Custom packages are some of our favorite projects. 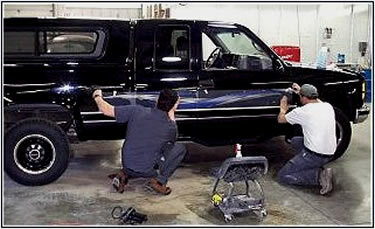 Here Nicolet Service Center technicians line up a decal while customizing this truck. Every project that we undertake is considered "custom" to us as no two jobs are ever the same. With that in mind, we encourage you to contact us to discuss your specific needs at (715) 369-3082 or e-mail us. We will gladly share our years of experience with you to ensure that your project meets your expectations! As always, free computer estimates and friendly service await you so why not contact us right now!? for any typographical errors, misinformation, or misprints.